Road Runner Girl: Groovy Baby Action Gear Review and GIVEAWAY!!! Do you love running? Do you love Disney? Do you love runDisney? If you answered yes to any of these questions then this review and giveaway is perfect for you! Last month when I posted about my Walt Disney World Marathon costume I got an email from Katie at Groovy Baby Action Gear! Katie is a runner, lover of Disney, and mom just like me! She quit working about a year and a half ago so she could stay home with her child. She also had dreams to start her own business. Her business....Groovy Baby Action Gear (isn't that name awesome?!) focuses on creating unique every day running sleeves and costume sleeves for Disney races and theme runs. She also makes team running sleeves (hey, hey Sole2Soul Sisters) and offers personalized lettering and logos on her sleeves too! She offered to sew me a pair of my own sleeves and host a giveaway for a pair on my blog. After looking at her stuff I immediately agreed! Her running sleeves looked awesome!!! 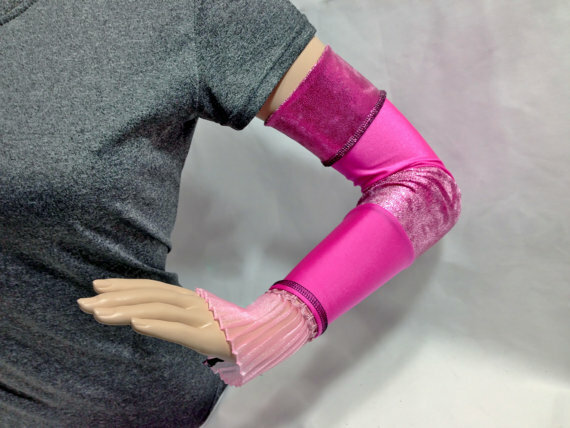 She has running sleeves that are inspired by the Disney Princesses...these would be PERFECT for the Disney Princess Half Marathon coming up this month! I so wish I'd known about Katie before my Disney Marathon! Look how cute these are for Sleeping Beauty!!! The hard part for me was picking which running sleeves I wanted Katie to make for me! I wanted ALL of them!!!! I finally settled on the Zebra of Fyah running sleeves! 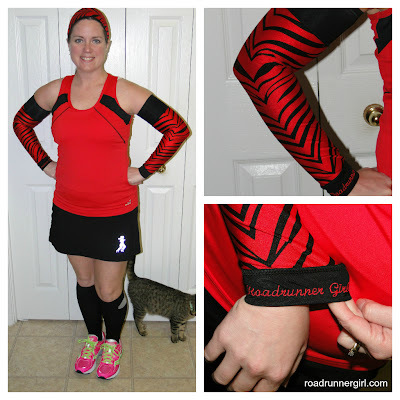 I loved the red and black and knew I could wear them with a lot of my running clothes. Ordering my running sleeves was really simple. All I had to do was give Katie my measurements...or I could go by my shirt size. I ended up measuring my arms as best as I could and sending that to her. She had my sleeves made in one day and already shipped to me...that is FAST! I couldn't wait to get them! When they arrived Katie had them packaged so pretty! They were sooo cute! Katie included an ear warmer AND she personalized mine with "Roadrunner Girl!" As soon as I opened them I had to try them on! And...they were too big. They fell off the top of my arms. :-( I immediately contacted Katie and told her they were too big. She was so apologetic but I told her it was most likely my fault and I probably measured my arms wrong! She sent me money to ship them back to her (WOW!) and it didn't take her long to fix them and ship them back to me. I was super impressed with how well she handled this and how she wanted to make sure the fit was perfect for me! And when I got them....they WERE a perfect fit!!!! I LOVED them!!!! I took them out for a run...and they didn't budge! I was afraid they would bug me or I would be constantly pulling them up but this was not the case! I could definitely wear these for a half or full marathon! And the cuteness is a plus...and a must for me lol! Overall...I am super impressed with Groovy Baby Action Gear! I definitely plan on ordering running sleeves for my next Disney race!!! So how about you? Would you like your own pair of running sleeves? Enter below for a chance to win!!! I will be announcing a winner on Friday so be sure to enter today!